The paper contributes to the empirical research on the micro-determinants of income inequality in Southeast European transition countries. The analysis utilizes data from a representative survey of 3,300 Bulgarian households conducted in 2007 and quantifies income differentiation effects related to certain socio-demographic characteristics. Quantile regression analysis reveals positive net effects of the degree of urbanization and the number of employed in the household as well as negative effects of the number of unemployed, children, and pensioners on the per-capita income level at all parts of the income distribution. 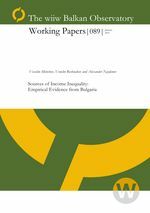 Inequality indices decomposition by subgroups identifies the type of settlement, ethnical group, the number of children and unemployed as substantial sources of income inequality in Bulgaria.